Usavich comes from Usagi meaning rabbit, and the "vich" gives the russian touch. 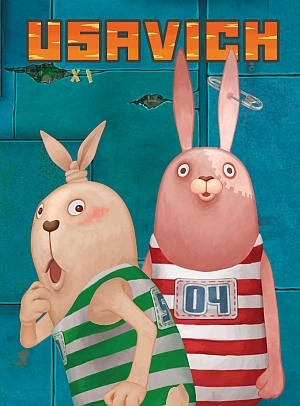 So the Usavichs are two rabbits serving time in a russian prison. The animated short stories are produced for MTV Japan by Kanaban Graphics. We show episodes of the first and second season at the beginning of every NIPPON DIGITAL session. das Studio Kanaban Design. 2006 entstand die erste Staffel von USAVICH. Zur Zeit arbeitet er an der neuen Animationsserie YAN YAN MACHIKO. Satoshi TOMIOKA studied at the Tokyo University of Technology and founded studio Kanaban Design in 2002. In 2006 he produced the first season of USAVICH. He is currently on the animation series YAN YAN MACHIKO.